The excavation campaign of Sal (approx. 6.5 km north-east of Irbid; Palestine grid 2358.2195) carried out in 1999 was a Jordanian-German Joint Project of Zeidan Kafafi and Dieter Vieweger on behalf of the Yarmouk University, Irbid, and the Kirchliche Hochschule Wuppertal. 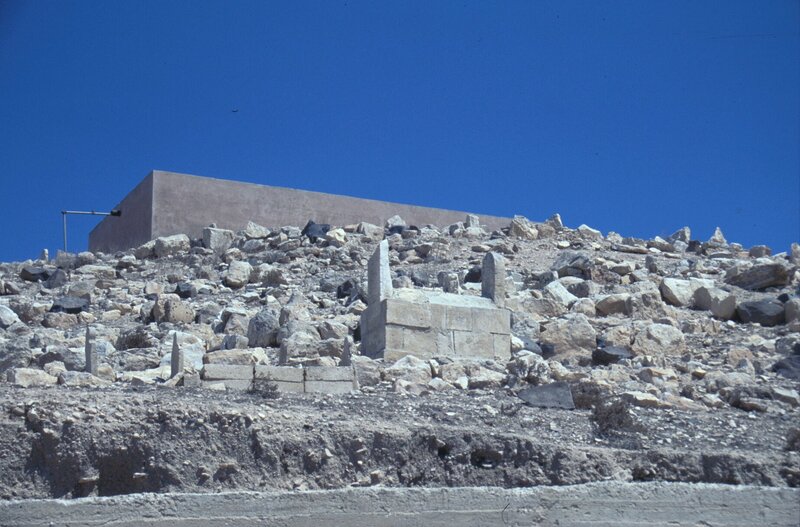 The excavation started on the 11th and ended on the 30th of September 1999. The place of the antique Sal seems to be one of the large Chalcolithic ‚mega-villages‘ in Palestine. Therefore and because of the very good geopolitical position in the today Irbid-Ramta-basin and the excellent agricultural environment it seems to be an outstanding place for an excavation; we hoped – if any Chalcolithic areas were undisturbed – to uncover areas of the different, maybe specialised housing areas of the Chalcolithic society. Possibly different functional use of some parts of the village are to state. First, you can find in badly destroyed places like Sal undisturbed – this means here unploughed – areas much easier than with common archaeological work. We are able to examine between 1.600 sqm to 2.400 sqm a day (under excellent conditions more) with only one geophysical system. On the base of these results we could decide in which parts of the fields in Sal we should expect architectonic features and undisturbed areas. Second, archaeological work – like test trenches or some squares in special selected areas – can interpret exemplary the geoelectric results over a large region sufficient. Third, we can leave undisturbed areas after the season – examined but not excavated (this means also ‚destroyed‘) – for further investigations. Fourth, in some parts olive trees will be planted very soon. 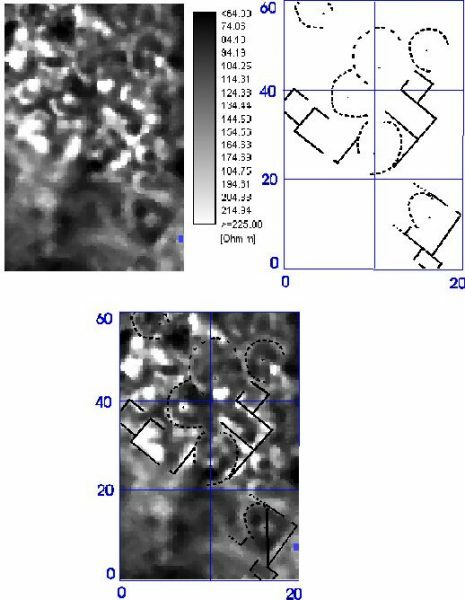 So we could size the last opportunity to get information from a large territoy – which could not be obtained by tradition excavation work with the existing budget. Additional geomagnetic or geoelectromagnetic work was not carried out in Sal for geological reasons. The high percentage of basalt stone in the earth here makes it impossible to obtain archaeological information with those geophysical methods. The great majority of the 48 idols from the Golan and the Hule-valley (already published by C. Epstein) were excavated in reliable house contexts or discovered within the limits of a recognised Chalcolithic site. Some of them are found in secondary usage in villages located near subsequently identified Chalcolithic sites, where they were presumably found on the surface. 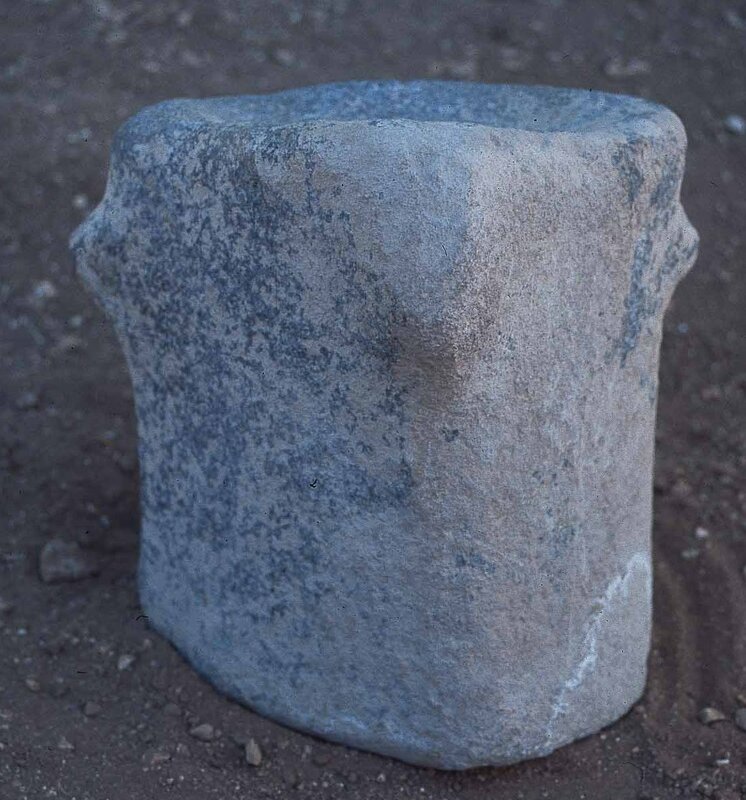 Similar to this second group the two new objects from Sal were discovered by the villagers – as they say – excavated by digging holes for the new olive trees. It is generally accepted that these objects are essentially cultic in character, and since they were originally placed in houses, that they formed part of a domestic cult intended to promote fertility. They are closely connected with the two main branches of the contemporary economy: sheep and goat rearing and agriculture. Chalcolithic inhabitants in Sal seemed to have been lived – on the base of our nowadays knowledge – in partly rock-cut houses. The prospected areas show a large area covered by houses, but not cramped or densely populated. There seemed to be enough space for courtyards, household areas etc. Certain is now a (middle) EB settlement outside the Tell with well built architecture in rectangular style. Unfortunately we do not know specific facts about this society because of the large destruction all over the site. First the authors would like to express their gratitude to the Department of Antiquities of Jordan, especially its Director-General, Dr. Fawwas Khreisheh, for its constant support. We are extremely thankful for the help of Wajeh Karasneh, director of the Department of Antiquities Irbid, and inspector Adnan Naqrash. The campaign based on the recent field survey which is part of the Hirbet ez-Zeraqon-survey, done during four weeks in the year 1989 by Prof. Dr. Siegfried Mittmann (Tübingen) and Dr. Jens Kamlah (Kiel). We have to thank for the valuable information given by S. Mittmann and J. Kamlah about their survey work in Sal. The authors prepared their excavation by field inspections in Sal during spring 1999. Siegfried Mittmann visited the site personally at that time. He gave us generous aid. We would like to extend special thanks to the foundation J. Mittelsten Scheid (Wuppertal), H. Löbbert (Akzenta Wuppertal), R. Schröder (Wuppertal) and the German Prostestant Institute for generous support and selfless finanzing this project. Also the excavation has obtained strong support from the German Protestant Institute, Amman. We are deeply impressed by the personal engagement and the unselfish help of its director, Dr. Hans-Dieter Bienert. The authors have to thank for hard, precious and keen work our stuff members, Muhammad Jaradat (Irbid), Patricia Ilona Kende (Stuttgart), Ute Koprivc (Wuppertal), Patrick Leiverkus (Wuppertal), Erich Lippmann (Schaufling), Ali Omari (Irbid), and Abdul al-Rahim (Irbid). We thank also for the support of Jens Eichner (Wuppertal). Zeidan Kafafi; Dieter Vieweger: Geoelectric and Archaeological Work at Sal, Jordan. A Preliminary report about the 1999 season at the Chalcolithic and Early Bronze Age site. Annual of the Department of Antiquities of Jordan, 2000, 173-191. Zeidan Kafafi; Dieter Vieweger, mit Beiträgen von Lambert van Es, Paul G. Höher, Muhammad Jaradat, Patrick Leiverkus und Erich Lippmann: Das chalkolithische und frühbronzeitliche Sal. Eine auf geoelektrischer Erkundung basierende Rettungsgrabung im Norden Jordaniens. In: Zeitschrift des Deutschen Palästina-Vereins 117, 2001, 5-46.